The 1955 model year was a watershed for DeSoto, as the company unveiled the Virgil Exner-penned “Forward Look” design. The design was a smashing success, nearly doubling DeSoto sales for the year, and it carried through to the end of the company’s production on November 30, 1960. The new high-line car in the 1955 DeSoto lineup was the Fireflite, with a snappy two-tone paint job and a list of features that would make any automaker proud. The 1955 DeSoto was more rakish and sporty looking than the standard run of Fords and Chevrolets that year, and the model was graced with an assortment of showy trim pieces. Bright backswept fender ornaments encompassed the headlights, a large hood ornament sat above the grille, trim adorned the hood line, a chrome-lined color sweep extended the length of the car, more trim was affixed to the lower rocker panel, and V-8 emblems abounded. Buyers could opt for a Coronado Fireflite, which added leather upholstery to the interior and a three-tone paint scheme to the exterior. Under the hood, all 1955 DeSotos featured a 291-cid, 200-hp Firedome hemi V-8 engine with a four-barrel carburetor. Transmission choices included a three-speed manual with optional overdrive, or the optional push-button PowerFlite automatic. Buyers could select the Fireflite in a variety of configurations, including four-door sedan, two-door hardtop coupe, and two-door convertible. Production totals were not high – about 37,000 Fireflites were made, compared to 80,000 of the base model Firedome. For 1956, DeSoto further upgraded the Forward Look design, delivering another stunning car that featured fins rather than a rounded rear end. Power was bumped to 255, PowerFlite transmission became standard equipment, and the automaker also boosted the electrical system to 12 volts, making the entire system more functional. A four-door Sportsman hardtop sedan was added, as was a special “Pacesetter” convertible commemorating the Fireflite’s selection as the pace car of the 1956 Indianapolis 500. Like most commemorative editions, these pace car replicas came loaded with options. In 1958, DeSoto started to hit hard times, with plunging sales and a general lack of public interest. The Fireflite remained the brand’s high-line car, with massive tailfins and a fancy two-tone paint scheme still dominated the design. The engine was changed from a hemi design to a to a wedge-chamber 361-cid V-8 with 305 hp. About 11,000 Fireflites were made in this year. The 1959 model year saw further body changes with large, protruding bumpers, even longer tailfins, and a full-length color panel stripe. DeSoto also offered another engine boost to 383-cid and 325 hp; however, only about 9,000 FireFlites were sold this year. The Fireflite name ended in 1960, although the few 1961 DeSotos made before the close of production were based on the Fireflite design. The 1960 Fireflite featured yet another new look, drawing closer to Chrysler’s design language and featuring even larger tailfins. A new grille gave the car a different front feel, and the distinctive two-tone paint schemes were all but gone. Engine power dropped to 295 hp and body styles were reduced to a four-door sedan and two- or four-door hardtops. Production jumped to nearly 15,000 cars, but the run was over, and it was a sad ending for a great line of cars. 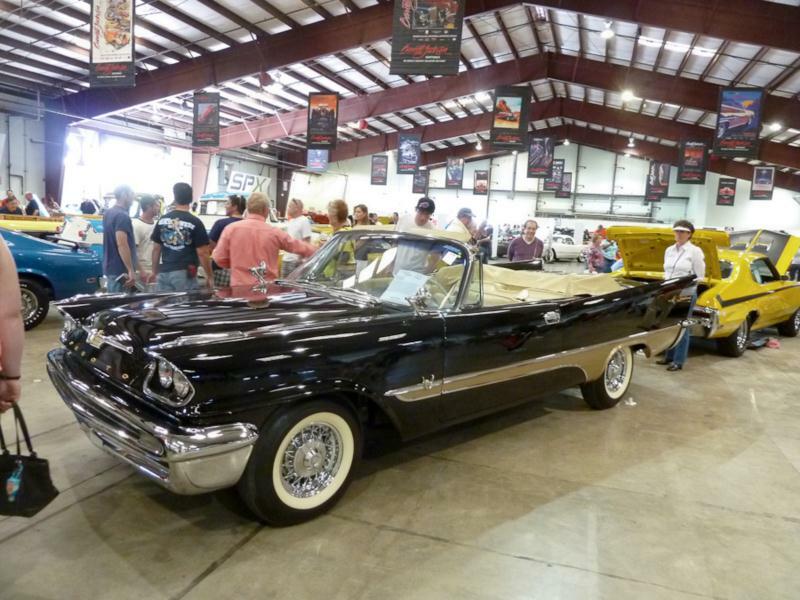 Collectors looking at the final years of DeSoto will want to seek out the 1956 Pacesetter commemorative editions, while power enthusiasts will likely prefer the 1958 and 1959 cars. Regardless any DeSoto Fireflite will be an attention-getter, as the cars are large, distinct, and luxurious. Examples with interesting options, such as swivel seats or 45 players are worth searching for. Incomplete cars can be more expensive than their price of entry might indicate, given the enormous amounts of trim these cars possess. As with any car of this era, rust is a common problem and should be avoided if at all possible.